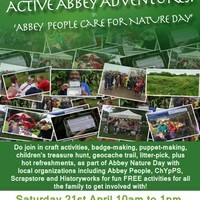 Home » News » Active Abbey Adventures! 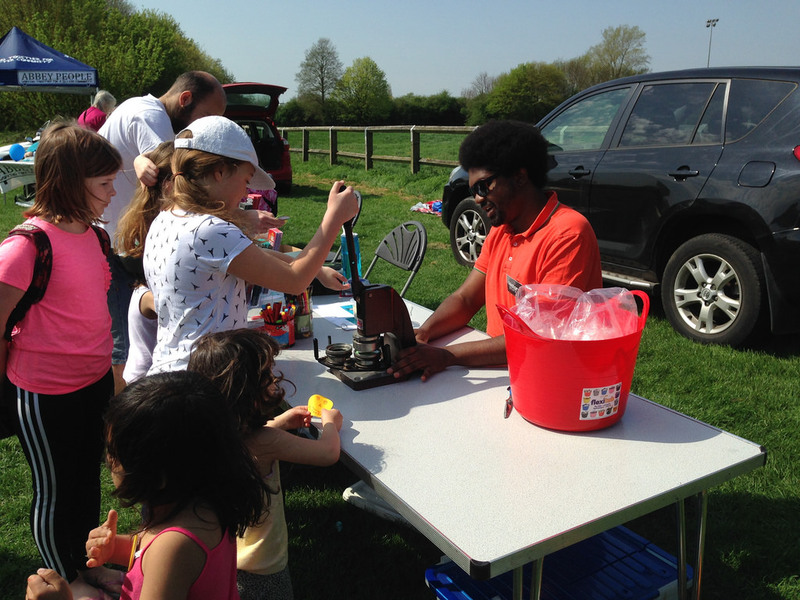 There was a fantastic community event organized by a collaboration of Abbey People and Historyworks as we came together to mark 'Abbey People Care for Nature Day' on Saturday 21st April and we had a reprief from the rainy season with lovely sunshine for our activities on Coldham's Common. 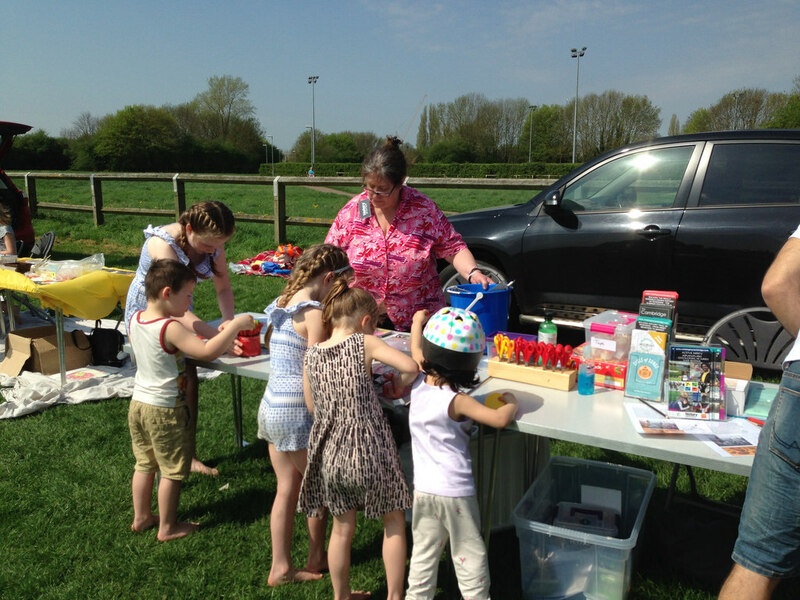 There was a litter-pick and craft activities, geocaching trails and refreshments for all the partcipants to enjoy at the end of the event! Historyworks had 3 tables of activities all with a nature theme to encourage participants, especially families and their children, to explore the area and appreciate the heritage and wildlife of Abbey. The main activity was giving out geocaching leaflets for 'Active Abbey Adventures' and showing families how to use their smartphones with our accompanying Historyworks leaflet which shows a geocaching trail around the Abbey ward with history summaries to unique and hidden places around the Abbey area, with a special focus on the old rifle range and the jurassic story of the coprolite deposits on Coldham's Common. In addition to the geocaching, Mario was on hand with Helen from Historyworks to deliver an activity for badge-making so that children could make their own badge to take home, but also make a badge to leave history-themed illustrated badges in the toy boxes along the geocaching trail around Coldham's Common and over to the lovely nature spot at the Margaret Wright Community Orchard. Helen Weinstein, the Director of Historyworks, was also on hand for the duration of the Abbey Nature Day, to tell people about the amazing wildlife on and around Coldham's Common, and to showcase the amazing heritage of nature on Coldham's Common, including the evidence from the Jurassic period of Pterosaurs and their deposits! Helen brought along the resources from Historyworks showing flying Pterosaurs and their poos called Coprolites, and the Coprolite Mines which brought riches to those involved in the Coprolite Mining Rush to dig up the Coprolite to use as super charged fertilizer in the Victorian period. On the craft table, Historyworks provided craft materials with the opportunity to make Pterosaur puppets and a Pterosaur scavenger trail with toy prizes! The Pterosaurs were flying lizards and had bulbous beaks for fishing, similar to Pelicans today. 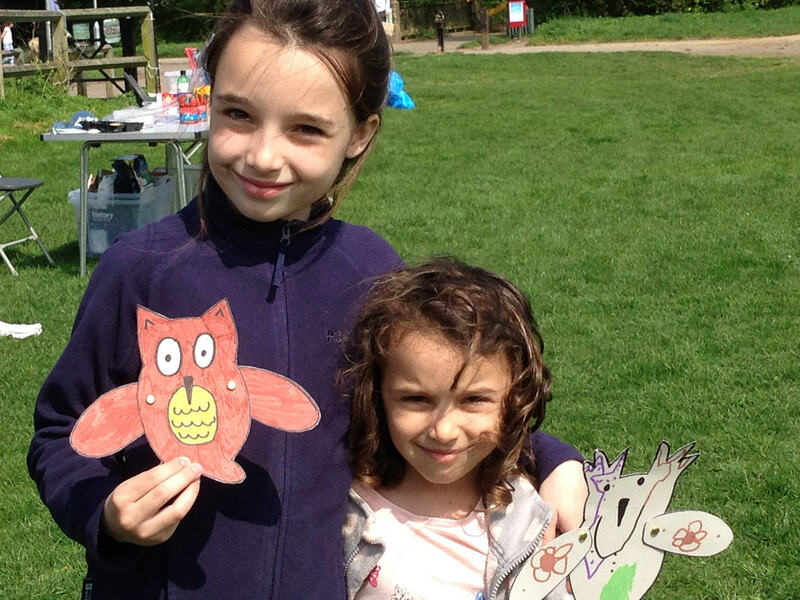 But the Pterosaurs from the Jurassic period are also directly related to Owls from today, so Helen also offered a craft activity to make Owl puppets and there were some fantastic owls produced by both adults and children! 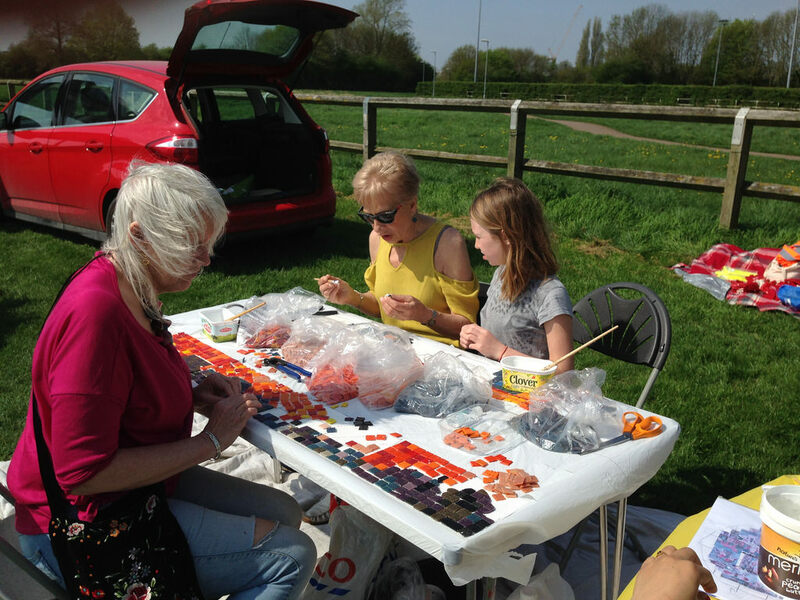 There were further fantastic wildlife craft activities with the mosaic segments produced by Jill and Cathy which allowed children and adults to complete the final sections for the Ditton Fields Mosaic, featuring robins and swans, and foliage. It looked fantastic and everyone must be very satisfied to be finishing the last bits before it is installed. 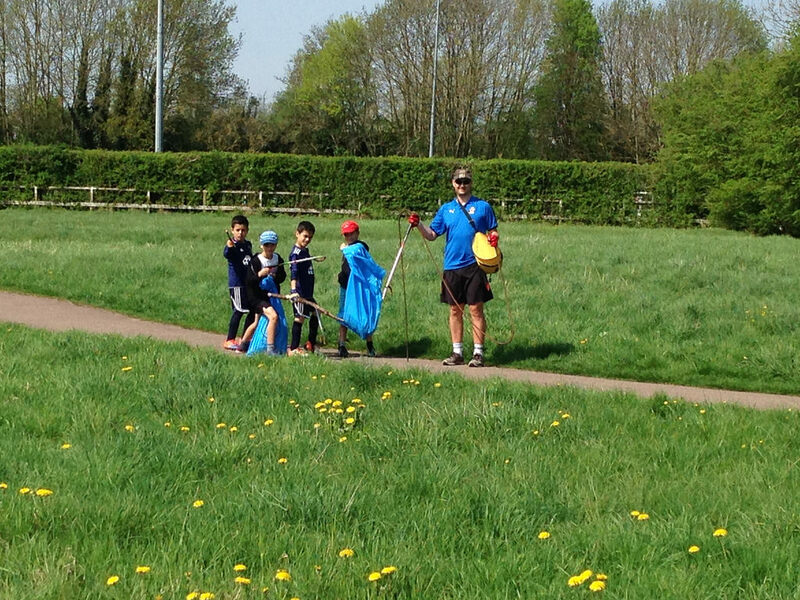 Abbey People also organized a litter pick by the Environment Volunteer for Nature Day, Jesus Zurdo, leading the way with his family, coming back with sackfulls of litter just from going around the BMX track area. It is surprising how much litter clutters up the hedgerows around the Common. In the photo you can see Simon Wall with a group of enthusiastic helpers, who went out across towards Coldham's Lane and came back with long bits of discarded metal and other random litter. All the people who use Coldham's Common for walks and sports will be very indebted to the litter pickers who every year do this fantastic service to show Abbey People care for Nature! Abbey People's Chair, Stuart Wood, came along just as everyone was getting hungry from their adventures around Coldham's Common, and it was wonderful to have the free refreshments of hot dogs and hot chocolate for all participants, which was a great reward after all the work on litter picking and crafting and geocaching! !